Color Tested: Silver Gray Heather - which is an ivory color with medium gray horizontal pin stripes. Other details: The shirt is 100% Merino wool jersey knit material and made in Vietnam. The shirt is Micro 150, the lightest base layer SmartWool makes and can be worn as either a base layer or on its own. The shirt also offers 30 SPF sun protection. 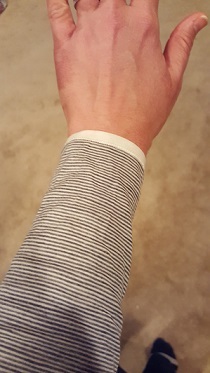 This shirt is a next-to-skin base layer. The hangtag attached to the shirt states that merino is the highest performing fiber known to outdoor athletes, works naturally with the body to heat and cool it, manage moisture, and is naturally stink-free. The merino used in this shirt is ZQ(tm) Merino which is backed by an international accreditation program that ensures that the highest standards of animal welfare, environmental and social sustainability are being upheld. The first thing that I noticed when I took the shirt out of its package was just how lightweight the shirt is. Of course I then tested the shirt to see how see through the fabric is and found that anything I wear under this shirt can be seen. I was a bit disappointed as this means when I wear this shirt alone, I will need to wear a shirt under it in order to feel comfortable. 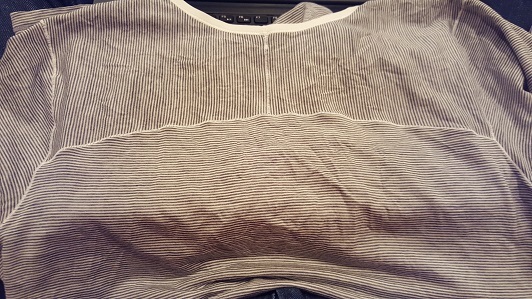 The next step was to try on the shirt to see how it fit since this is the first SmartWool top I have tried. At 5'10" (170 cm), I am not a short woman and usually sleeves and hemlines are short on me. I was very happy that the sleeves came to my wrists and the top covered my pants' waistline and fell over 6" (15 cm) below the waistline. The shirt is listed as form fitting - which according to SmartWool's website - is a slim fit that follows the body's contours. I am between sizes (M and L), so I decided to test the larger size since it is form fitting. I am glad that I did as I do not like my clothes skintight and the smaller side would have been tight on me, but wearable. The seams look well-constructed and are flat and sewn with an overlock stitch which allows them to stretch along with the knit fabric of the top. The sleeves are raglan style, which means that the seams are on the back and front of the shoulders instead of the top. The back has a high seam across the shoulders, but is above the area where my backpack rides. Additionally, the side seams angle in towards the front center of the shirt. The neckline and sleeves are trimmed with ivory colored stretch ribbon-like fabric. 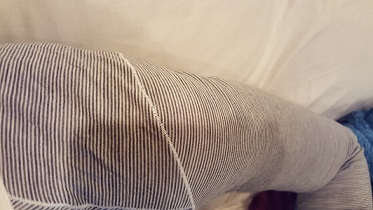 There is a small SmartWool logo on the front left of the shirt just above the hem. I am interested to see just how "no stink" SmartWool's merino wool actually is after a few days on the trail. Also, since this shirt can be washed and dried, I will be interested to see if it shrinks after washing and/or over time. Also, since it is made from a knit material - how much will the shirt stretch/change shape over time. The shirt can be machine washed with warm water on the gentle cycle without bleach. Tumble dry on low, cool iron when needed. The shirt can also be dry cleaned. For best appearance, wash garment inside out and lay flat/line dry. The care instructions do not list a specific type of laundry soap to wash the shirt. I'll probably machine wash then line dry since everything dries in a snap here in Arizona thanks to a lack of humidity. Overall, I like this shirt so far, but check back in 2 months to see how it has held up against prickly desert plants and rocks! Thank you BackpackGearTest.org and SmartWool for the chance to look smart on the trails this winter season! Trail Conditions: well-maintained trail, dry and dusty with some coblestone areas. So far I have used this shirt both for warmth as well as sun protection. Often worn on the same hike since the temperature can fluctuate by 30 F (17 F) degrees or more between dawn and the heat of the afternoon. On backpacking trips, I will wear the shirt with a down vest around camp in the evening before it gets cold enough to add on a down jacket. During the day I wear the shirt for sun protection as the shirt is rated SPF 30. I have been in the sun with no sun screen under the shirt for the main sun hours of 10 am to 2 pm and have not burnt through the shirt. I do feel that the shirt holds some moisture when I am hot and sweating in the sun, this helps to keep me cool in the sun. As with all shirts I have ever worn, my back is a sweaty mess and the shirt is dripping with sweat when wearing a backpack of any kind and exerting in the sun. On one of my backpacking trips, an ember from the fire landed on the shirt. I noticed that the ember glowed for a few seconds and went out. I carefully checked the shirt, but I did not see any scorch marks and the ember did not burn my skin. Several of my trips have involved some either off trail hiking and/or overgrown trails, both have subjected this shirt to cat's claw - a thorny bush with thorns that look just like a cat's claw and shred anything, flesh or fabric, that gets caught on them. While I have snagged this shirt a few times, so far there are no holes or rips in the fabric. 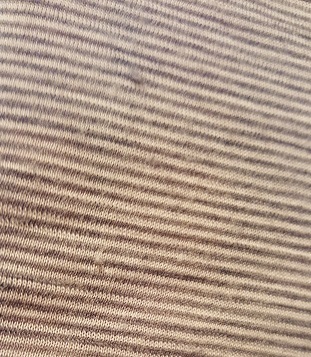 I have noticed that the seam threads have started to fuzz (see picture). 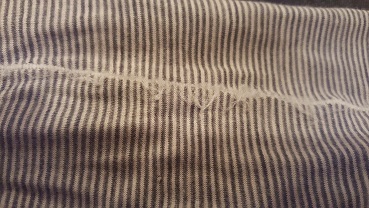 This does not appear to affect the quality of the seam, but for appearances I'm not a huge fan of fuzzy seams. Other than that, the shirt is still in great condition with no visible stains. My skin is somewhat sensitive, but I do not have a wool allergy. That being said, I do find that the shirt is a bit itchy when I compare it to a cotton-bamboo shirt that I use to wear. It's enough that I notice this increased itchiness, but not so much that I don't want to wear the shirt again. So far I am enjoying the shirt - it works well to provide some warmth on cool mornings and protect me from the sun on warm afternoons. Its held up well to thorns and embers so far, the only sign of wear so far is on the under arm seams. I'll keep testing out this shirt in the coming months, so check back in two months to read my final review. I have had this shirt in all types of weather - from wearing it as a base layer when it's around freezing or using it for sun protection in temps around 100 F/38 C. I have been happy with the overall feel of the shirt in all settings. It does well at wicking moisture away from the skin, of course my back is always a sloppy, wet mess while backpacking, but I don't think that is the fault of the shirt as I am sweater by nature. I have hiked in very dry climate - Arizona and Death Valley, CA as well as very humid conditions in Hawaii and have found that the shirt handles both like a champ, doing its best to keep me cool and comfortable. Overall, this shirt has taking a pretty good beating and it is still in good overall condition. It does have a two tiny snag holes, but seeing as most of my hikes are in Arizona and involve thorny bushes and trees that like to shred skin and clothes, I think two tiny snag holes are nothing. The under forearm seams have continued to fuzz and are as fuzzy are ever! This is a purely aesthetic complaint as the seams is still holding up well and I cannot feel it when I wear it. That said, the fuzzy seams mean that I wouldn't want to wear this top out on the town anymore. Most of the time I have worn this top while carrying a daypack or backpack and as a result there is some minor pilling across the shoulders and back that I only noticed with looking at the shirt while writing this review. I did accidentally put the shirt through the dryer on the medium heat setting with my other hiking clothes. The shirt did not shrink and did not appear to be harmed. Other than that one time, I have followed the directions and allowed the shirt to air dry. I think that the shirt still fits the same today as it did when I got it 4 months ago. I really like the overall fit as the sleeves are long enough for me and the shirt does not ride above my waistline when I sit down. Overall, I love this top! It has become a staple in my hiking wardrobe and I hope to use it for years to come. Thank you BackpackGearTest.org and SmartWool allowing me to change to test out this shirt. This concludes my test series. This report was created with the BackpackGearTest.org Report Writer Version 1. Copyright 2016. All rights reserved.